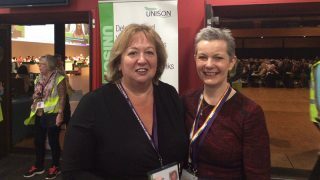 The decision taken today (Wednesday) by the board of Wrightington, Wigan and Leigh NHS Trust to push ahead with the outsourcing of hundreds of staff is reckless and foolhardly, says UNISON. Responding to the decision, staff at Wrightington, Wigan and Leigh NHS Trust are taking five days of strike action, starting at 6am tomorrow (Thursday). This is the third strike by employees in protest at the proposals. The trust plans to transfer around 900 staff, working as porters, cleaners and caterers, to the wholly owned subsidiary, WWL Solutions. 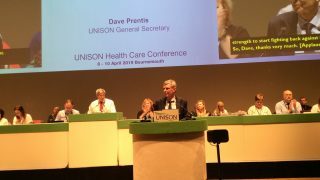 UNISON general secretary Dave Prentis said: “Despite being given every opportunity to step back from the precipice, the trust has recklessly decided to go ahead with an ill-advised plan that’s bad for patients, staff and services. “As the NHS approaches its 70th birthday, the people served by Wrightington, Wigan and Leigh Trust deserve so much better. “Staff will continue to fight against this foolhardy plan, as they reluctantly take their third round of strike action. – UNISON general secretary Dave Prentis will be on the picket line with workers at the Royal Albert Edward Infirmary in Wigan from 8.30am on Thursday 28 June.